The Cowboy Birder: Great Grey Shrike on Wanstead Flats - now that sounds good! 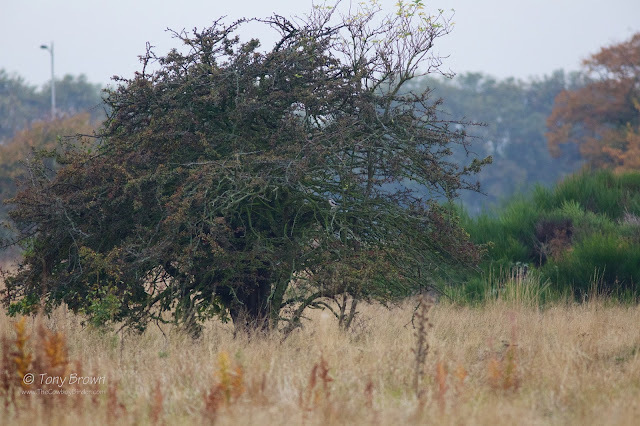 Great Grey Shrike on Wanstead Flats - now that sounds good! 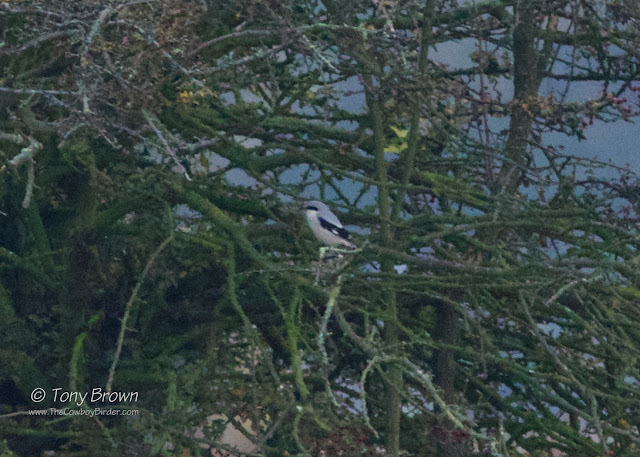 After seeing an Isabelline Shrike yesterday, I didn't think I'd be be writing about seeing another Shrike so soon - and a Shrike on the patch no less! I followed my usual Saturday morning routine of being on the Flats for first light, but heavy, low cloud cover had made the early morning feel even darker and gloomier than usual. As I made my way around Alexandra Lake I could here a small party of Siskin calling and were the first birds of any note, the scrub around the pub was quiet so I headed back past the lake and along the Ditch of Despair (or Delight, depending on what you find there), and in the distance I can just make out a bird with the naked eye in the gloom, perched up on an exposed bush on the strip of grassland that separates the football pitches, lifting my bins the unmistakable shape of a Great Grey Shrike is staring back at me!! A big rush of emotions quickly entered my head, first; I need a record shot, and second; I need to get the news out to the patch regulars, but within a split second of seeing the bird and whilst trying to move a bit closer (not easy in the long grass) the bird had simply disappeared! I carry on walking right up to the bush and look around - nothing, where had the bugger gone? Whilst scanning the area, I phoned Jono and Nick and tweeted the news out, luckily Jono was already on the patch at the Vis Mig point and within five minutes he was standing beside me, but with no sign of the bird I thought it was going to be one of those single observer sightings and with no record shots either - I could see things being a little bit prickly at the Wanstead birders annual Christmas drinks - I needed to re-find this bird. After a quick discussion and a well done from Jono (through gritted teeth at this point) we decided to spilt up and try and cover as much ground as possible. An agonising 15 minutes went by before I re-found the bird perched up on a Hawthorn bush in the Broom fields - I fire off a distant record shot and then quickly ring Jono who I can see is also in the Broom fields but on the wrong side of the bush! I direct him towards the bush and bingo the bird flies out and along centre path in full view of Jono - at this point I can see Jono punching the air with delight. Bob has now appeared, and with impeccable timing also sees the bird in flight across the Brooms (I think there is some kind of group hug at this point, but as I'm overdosing on adrenaline it's all a bit vague). The three us manage to see the bird perched up briefly once more, before it seemed to disappear into Centre Copse. Nick, Richard, Tim and James have all now arrived on the scene but despite covering every inch of the Flats between us over the next couple of hours, disappointingly we are unable to find the bird again. 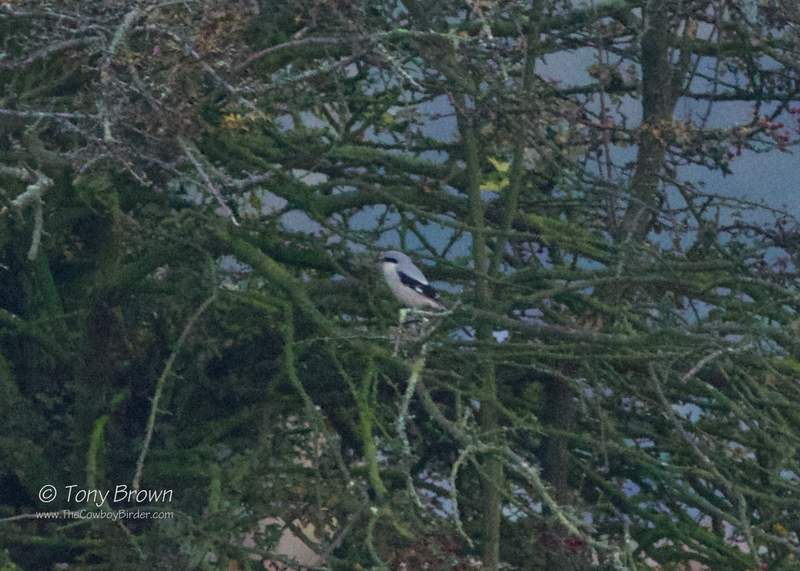 Heavily cropped, but yes, oh yes - That's a Great Grey Shrike! This was the 1st record of Great Grey Shrike on Wanstead Flats and only the 3rd ever for the patch, with two records in the 1970's in Wanstead Park - the last one being in 1977 around the Old Sewage Works, a mere 39 years ago. Brilliant. At first I thought you might still be drunk, let's face it, it has been known. But superb, glad I was out this morning to share it with you. That's the trouble with birding the patch on a Saturday morning, Friday night beers!